How would you like to enjoy “An Afternoon of American Music” on a lazy Sunday afternoon this November? If you’re near Cupertino, CA on Sunday, 8 November, you’re in luck. 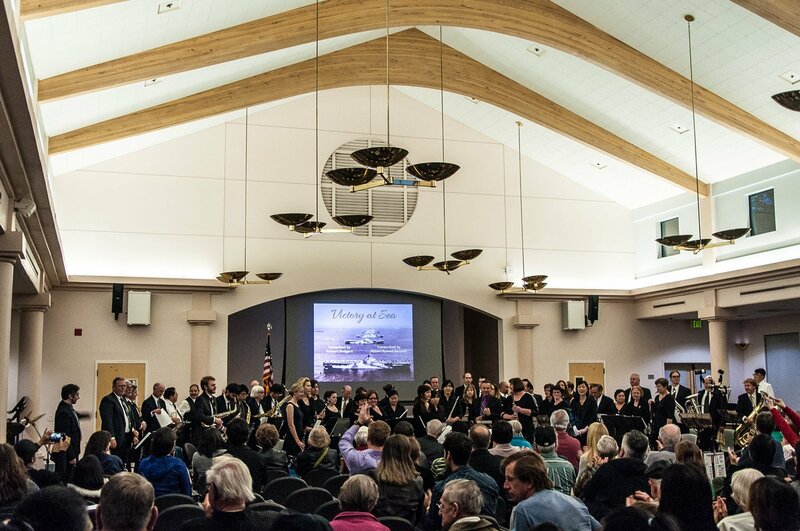 The Cupertino Symphonic Band is going to be performing at the Quinlan Community Center in Cupertino at 3PM. This annual concert is presented to honor our veterans on the Sunday closest to Veteran’s Day and promises to be a moving experience. In addition to a program of symphonic American music, the CSB Jazz Ensemble will also be making an appearance playing a few charts during intermission. How does CSB help the community? While CSB concerts are free to the public, making quality music accessible to everyone, the band also encourages attendees to make canned food donations at all of its Quinlan concerts which benefit the West Valley Community Services organization. The band welcomes musicians of all ages and skill levels to join its ranks. Whether someone is an experienced musician, a student just getting their feet under them, or someone who used to play and is looking for a reason to dust off that instrument sitting in the closet, CSB welcomes them with open arms. It’s a great way to share in the joy of making music in a rich ensemble atmosphere. I can speak from experience about CSB. Like many people, I grew up learning music in addition to all of my other studies. I started on piano at an early age. When I hit fourth grade, I took up the clarinet, and eventually picked up other woodwinds along the way. I stayed very active in music all through school, including university – I even founded a ragtime band through the Chemistry Club (Avogadro’s Ragtime Band), but that’s a separate story. Early in my career after finishing my degrees, I was busy being an engineer, so making music fell to something I did mostly by myself in my living room. Then one day many years ago, I stumbled across CSB and attended a rehearsal. After that, I played with the band for several years. It was my first step getting back into ensemble play after a lengthy break. While I’m no longer a regular member of the band, I have subbed for a rehearsal or a concert on occasion, and now, I’ve very recently joined the CSB Jazz Ensemble, so there will be no A Good Reed Review review for this concert. I’ll be there on the 8th playing the intermission jazz set and hope to see you there.